Seventeen years ago, the Bytyqi brothers from New York were murdered and dumped in a mass grave by Serbian special forces. Today, Serbia's leaders continue to deny closure and justice to the victims and their families. 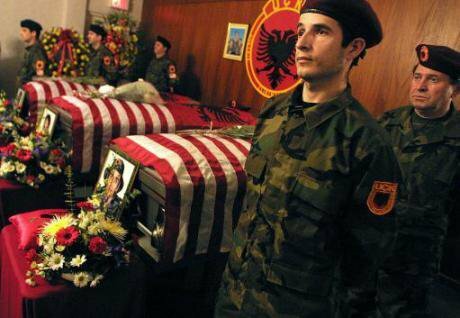 A Kosovo Liberation Army honour guard stands besides the coffins of the three Bytyqi brothers during a wake held in New York, 3 March 2002. Paimages/Shawn Baldwin. All rights reserved. Summer isn’t meant to be experienced like a slow motion horror film. But for thousands of Balkan families, the second week of July isn’t filled with family picnics and joyful reunions. It is reliving kidnappings, rapes, torture, and murder. Twenty-one years ago, roughly 8,000 Muslim men and boys as young as ten years old were rounded up and summarily executed in Srebrenica by the Bosnian Serb Army, an army supported by Serbian officials. Seventeen years ago, three brothers from New York - the Bytyqis - were murdered and dumped in a mass grave by Serbian special forces. That mass grave was one of several in Serbia that together contained more than 900 Albanian bodies, reburied to cover-up ethnically-based, state-driven mass murder. These war crimes share another common and regrettable feature: the relentless efforts of Serbia’s current political leaders to deny closure and extend justice to victims and their families. Last Friday, we were among dozens of distinguished academics, authors, former U.S. officials, and human rights activists who joined an open letter to U.S. and E.U. leaders to bring greater scrutiny to Serbia’s failures in the Bytyqi case and other unresolved war crimes. In the Bytyqi case, a Serbian President and the two most recent Prime Ministers have repeatedly promised resolution since 2006, but have failed to take adequate steps to secure this result. Over a year ago, Prime Minister Vucic doubled down on these earlier promises when he said in a public forum, "Don't worry, we'll resolve [the Bytyqi murders], and I think that it's our job, it's our duty to do it.... [Resolution will] happen very soon or much sooner than anybody might expect." No credible steps ensued. Worse yet, Prime Minister Vucic and President Tomislav Nikolic still keep Goran Radosavljevic, the primary suspect in the case and someone likely responsible for many other crimes and their cover-up operations, as a close advisor within the leadership of their governing party. The failures in the Bytyqi case are not unique. Despite an estimated 3,000 suspected war criminals roaming free in Serbia, prosecutors filed only seven indictments in 2014, the majority of which were simply based on files transferred from prosecutors in Bosnia and Herzegovina. In 2015, prosecutors didn’t issue a single confirmed indictment. Much of this is due to a failure of governance. Among other things, Mr. Vucic has failed to address a broken witness protection system, the absence of a lustration law, and inadequately staffed prosecutorial units. At a deeper level, however, Serbia’s war crimes record is due to a failure of political will. Victims, witnesses, and progressive stakeholders aren't fighting on neutral playing fields when President Nikolic and Prime Minister Vucic openly commiserate with suspected war criminals like Radosavljevic. At the same time we published our letter, responsible actors in Serbia are fighting the steepest of uphill battles for the State to join the consensus conclusion that what happened in Srebrenica was genocide. A year ago, President Tomislav Nikolic personally appealed to Russian President Vladimir Putin to block a United Nations resolution recognizing Srebrenica as genocide. The government also shut down civil society efforts to commemorate the anniversary, even arresting and prosecuting one prominent activist. While Prime Minister Vucic has taken some constructive steps to encourage reconciliation in the region, he joins Nikolic in condemning Srebrenica as only a “grave crime”, just not genocide and all the implications that label has for the responsibility of the State they lead. This fight against history goes beyond disputing the level of crimes committed in Srebrenica. Government Ministers regularly host “welcome home” parties for returning convicts of the International Criminal Tribunal for the Former Yugoslavia (ICTY). More recently, Mr. Vucic and his previous Foreign Minister have incredibly suggested that Slobodan Milosevic – yes, that Milosevic – was a victim. Justice will be forever delayed and reconciliation too incremental to be meaningful so long as Serbia’s leaders choose to side with war criminals over victims. US and EU leaders have a unique obligation to force Serbia to right these wrongs. With the ICTY winding down, the hard work for its countries of focus is nowhere near complete. Henceforth in Serbia and across the Balkans, only domestic prosecutions can deliver victims justice. Reconciliation, in turn, requires acknowledgement. Serbia’s leaders have effectively proven that left to their own devices, they choose not to face its sordid past. Until they do,Serbia’s future prospects as a democracy rests on dubious ground.